Why did this exploit work in the wild but not against runs in my "lab"? tl;dr: Differences in NT/HAL between single-core/multi-core/PAE CPU installs causes FuzzBunch's XP payload to abort prematurely on single-core installs. As it turns out, the exploit was working just fine in the lab. What was failing was FuzzBunch's payload. kd> ba w 1 ffdffc50 "ba e 1 poi(ffdffc50)+0x170;g;"
The single-core machine did not find hal!HalInitializeProcessor... sub_547 instead returned NULL. The payload cannot continue, and will now self destruct by zeroing as much of itself out as it can and set up a ROP chain to free some memory and resume execution. Note: This post does not explain the EternalRomance exploit chain, just a quirky bug in the Equation Group's client. For comprehensive exploit details, come see my presentation at DEF CON 26 (August 2018). In SMBv1, transactions are looked up via their User ID, Tree ID, Process ID, and Multiplex ID fields (UID, TID, PID, MID). This allows a client to have many transactions running at once, as needed. UID and TID are server-assigned, and PID is client-set but usually static. Generally, a client will only use the MID, set to a random value, to distinguish distinct transactions. In EternalRomance, the MID must be set to a specific value (File ID). In order for the Equation Group to multiplex multiple transactions, the PID is used instead. The PID is what separates "dynamite sticks" in the Fish-In-A-Barrel heap feng shui. Dynamite are transactions that can (ideally) cause overflow into another transaction. Sometimes a dynamite stick fails, simply because memory allocations can be volatile. In this case, EternalRomance should try the next stick. I had nop'd out the Srv.sys vulnerability being exploited using WinDbg so that I could observe the network traffic during failures and other various reasons. I noticed that EternalRomance, during the grooming phase, sent dynamite sticks with PIDs 0, 1, and 2. However, it was only attempting to ignite one PID (dynamite stick) for every execution attempt. The PID 0. This must be a mistake because igniting the same dynamite 3 times in a row does absolutely nothing but send superfluous network traffic with no change in result. A dynamite stick either works or it simply always will be a dud. And besides, why did it bother to send the other 2 dynamite in the first place? In fact, igniting the same dynamite stick multiple times is dangerous, because it increments a pointer each time, and the offset for the overwrite (a neighboring MID) stays static. On a side note, I also noticed the first exploit attempt always tries to overwrite two bytes, and all secondary dynamite attempts only overwrite one byte. Because of the way they set up the exploit, only a one byte overwrite is necessary (though two bytes won't hurt if it hits the right place). Another peculiarity. I messed around with the MaxExploitAttempt settings, which has a default value of 3. I set it to its maximum allowed of 16. Now the PID started at 3? This time, PIDs 3 through 15 were observed, and the last 3 exploit attempts sent PID=0. Well some debugging later, I figured out that the InitializeParameters() function (there are no symbols in the binary, but a few functions have helpful debug strings when handling error conditions) was allocating two arrays for the dynamite stick PIDs. TbMalloc is Equation Group's library function (tibe-2.dll) that just calls malloc() and then memset() to 0 (essentially calloc() but with one argument). I set a hardware breakpoint on the tables and noticed that in SmbRemoteApiTransactionGroom() (another unnamed function) there was the following logic. This function completes when the dynamite are initially sent (before any are ignited). Later, in DoWriteAndXExploitTransactionForRemApi(), the table where DynamiteNum >= 3 is used to source PIDs to ignite the dynamite. This means PidTable_0x44a4 is never given values when MaxExploitAttempts=3. Observe 3 shorts set to 0 at the address in the dump. And we can see the cause for the quirky behavior of the network traffic starting at PID=3, when MaxExploitAttempts=16 (or any greater than 3). Observe several shorts incrementing from 3, followed by three 0. As far as I can tell, the PidTable_0x44a0 table (the one that holds the first 3 PIDs) simply isn't used, at least when tested against several versions of Windows XP and Server 2003. The real mystery is why is there this logic for the second table that isn't used? Update July 3, 2017: FuzzySec has also previously written some info about this. Ever since I began reverse engineering Shadow Brokers dumps   , I've gotten into the habit of codenaming my projects. This trick is called Puppet Strings , and it lets you hitch a free ride into Ring 0 (kernel mode) on Windows. Some nation-state malware, such as Backdoor.Remsec by the ProjectSauron/Strider APT and Trojan.Turla by the Turla APT, performs a similar operation. However, the traditional nation-state modus operandi involves 0-day exploitation. But why waste 0-days when you can use kn0wn-days? If you're running as an elevated admin, you're allowed to load (signed) drivers. Local users are almost always admins. UAC is known to be fundamentally broken. Load any (signed) driver with a kn0wn code execution vulnerability and exploit it. It's a fairly obvious idea, and elementary to perform. Windows does not have robust certificate revocation. Thus, the DSE trust model is fundamentally broken! Ordinarily, Ring 0 is forbidden unless you have an approved Extended Validation (EV) Code-Signing Certificate (out of reach for most, especially for malicious purposes). There is a "Driver Signature Enforcement" (DSE) security feature present in all modern 64-bit versions of Windows. This enforcement can only be "officially" bypassed in two ways: attaching a kernel debugger or configuration at the advanced boot options menu. While these are common procedures for driver developers, they are highly-atypical actions for the average user. Originally introduced in September 2016 as a form of video game anti-cheat, it was quickly discovered that the capcom.sys driver has an ioctl which disables Supervisor Mode Execution Prevention (SMEP) and executes a provided Ring 3 (user mode) function pointer with Ring 0 privileges. It's even kind enough to pass you a function pointer to MmGetSystemRoutineAddress(), which is basically like GetProcAddress() but for ntoskrnl.exe exports. The unfortunate part is it can still be easily loaded and exploited to this day. My opinion: file reputation for signed binaries should factor in cert validity period, revocation, digest algorithm, and file prevalence. If a driver is signed with a valid timestamp, it also doesn't matter if the certificate has expired, as long as it isn't revoked. This trick is only possible because the Microsoft and root CA mechanisms for revoking driver signatures seems bad. This halfhearted approach violates the trust model that public key infrastructure is supposed to be built upon, as defined in the X.509 standard. Perhaps like UAC it is not a security boundary? Capcom.sys has been around for almost a year, and is easily one of the most well-known and simplest driver exploits of all time. While this driver is flagged 15/61 on VirusTotal, I have a personal list of known-vulnerable drivers that are 0/61 detection. They aren't too hard to find if you keep your eyes open to netsec news. Code is available on GitHub at zerosum0x0/puppetstrings. To run it, you will need to independently obtain the capcom.sys driver (I don't want to deal with weird licensing issues). Test system was Windows 10 x64 Redstone 3 (Insider pre-release), just to show the new Driver Signing Policies (and its list of exceptions) introduced in Redstone 1 do not address this issue. This works on all versions of Windows if you update the EPROCESS.ActiveProcessLinks offset. For the PoC, I had to do something relatively malicious to get the point across. Getting to Ring 0 with this technique is simple, doing something interesting once there is more difficult (e.g. we can already load drivers, the usual SYSTEM shell can be obtained through less dangerous methods). I load capcom.sys, pass it a function which performs the old rootkit technique of unlinking the current process from the EPROCESS.ActiveProcessLinks circularly-linked list, and then unload capcom.sys. This methodology is instant and makes the current process not show up in user mode tools like tasklist.exe. Of course, doing this in a modern rootkit is foolish, as PatchGuard has at least 4 different process list checks (CRITICAL_STRUCTURE_CORRUPTION Bug Check Arg4 = 4, 5, 1A, and 1B). But you can get experimental and think of something else cool to do, as you enjoy all of the freedoms Ring 0 brings. If you want to learn more about techniques like this, come to the Advanced Windows Post-Exploitation / Malware Forward Engineering DEF CON 25 workshop. This technique uses SetThreadContext() to change a selected thread's registers, and performs a restoration process with NtContinue(). This means the hijacked thread can keep doing whatever it was doing, which may be a critical function of the injected application. 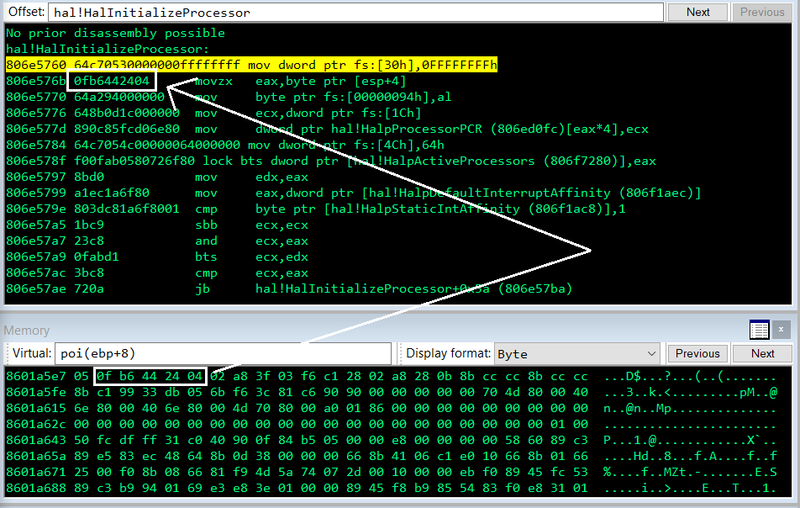 You'll notice the PoC (x64 only, #lazy) is using the common VirtualAllocEx() and WriteVirtualMemory() functions. But instead of creating a new remote thread, we piggyback off of an existing one, and restore the original context when we're done with it. This can be done locally (current process) and remotely (target process). Process is opened, and any thread is found. Thread is suspended, and thread context (CPU registers) copied. Memory allocated in remote process for reflective DLL. Memory allocated in remote process for thread context. Set the thread context stack pointer to a lower address. Change thread context with SetThreadContext(). Normal reflective DLL injection takes place. Optional: Spawn new thread locally for a primary payload. Optional: Thread is restored with NtContinue(), using the passed-in previous context. 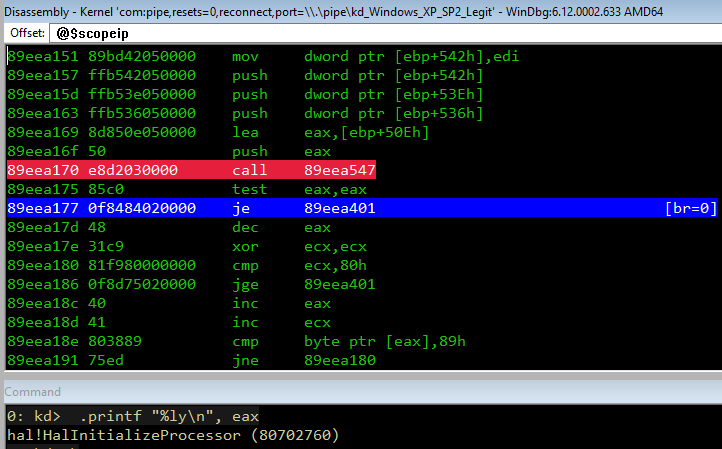 You can go from x64->SysWow64 using Wow64SetThreadContext(), but not the other way around. I unfortunately did not observe possible sorcery for SysWow64->x64. One major hiccup to overcome, in x64 mode, is that the register RCX (function param 1) is volatile even across a SetThreadContext() call. To overcome this, I stored a cave (in this case, the DOS header). Luckily, NtContinue() allows setting the volatile registers, so there's no issues in the restoration process, otherwise it would have needed a hacky code cave inserted or something. Another issue is we could corrupt the original threads stack. I subtracted 0x2000 from RSP to find a new spot to spam up. I've seen similar (but non-successful) techniques for code injection. I found a rare amount of similar information  . These techniques were not interested in performing proper cleanup of the stolen thread, which is not practical in many circumstances. This is essentially the same process that RtlRemoteCall() follows. As such, there may be issues for threads in a wait state returning an incorrect status? None of these sources uses reflective restoration. As user mode API is highly explored territory, this may not be an original technique. If so, take the example for what it is ([relatively] clean code with academic explanation) and chalk it up to multiple discovery. Leave flames, spam, and questions in the comments! Windows 10 Redstone 3 (Fall Creator's Update) is adding Exploit Guard, bringing EMET's Export Address Table Access Filtering (EAF) mitigation, among others, to the system. We are still living in a golden era of Windows exploitation and post-exploitation, compared to the way things will be once the world moves onto Windows 10. This is a mitigation that will need to be bypassed sooner or later. EAF sets hardware breakpoints that check for legitimate access when the function exports of KERNEL32.DLL and NTDLL.DLL are read. It does this by checking if the offending caller code is part of a legitimately loaded module (which reflective DLL injection is not). 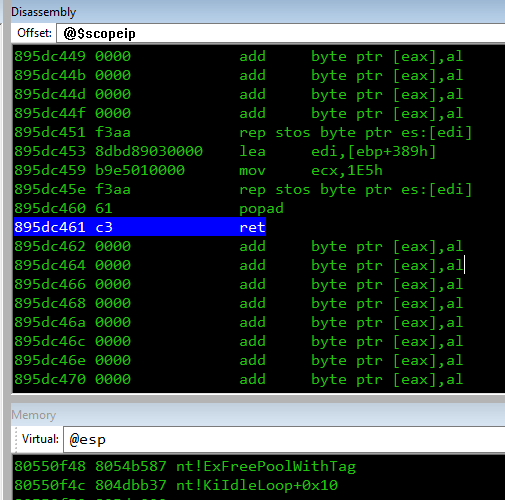 EAF+ adds another breakpoint for KERNELBASE.DLL. One bypass was searching a DLL such as USER32.DLL for its imports, however Windows 10 will also be adding the brand new Import Address Table Access Filtering (IAF). So how can we avoid the EAF exploit mitigation? Simple, reflective DLLs, just like normal DLLs, take an LPVOID lpParam. Currently, the loader code does nothing with this besides forwarding it to DllMain. We can allocate and pass a pointer to this struct. Instead of performing two allocations, we could also shove this information in a code cave at start of the ReflectiveLoader(), or in the DOS headers. I don't think DOS headers are viable for Metasploit, which inserts shellcode there (that does some MSF setup and jumps to ReflectiveLoader(), so you can start execution at offset 0), but perhaps in the stub between the DOS->e_lfanew field and the NT headers. Reflective DLLs search backwards in memory for their base MZ DOS header address, requiring a second function with the _ReturnAddress() intrinsic. We know this information and can avoid the entire process (note: method not possible if we shove in DOS headers). Likewise, the addresses for the APIs we need are also known information before the reflective loader is called. While it's true that there is full ASLR for most loaded DLL modules these days, KERNEL32.DLL and NTDLL.DLL are only randomized upon system boot. Unless we do something weird, the addresses we see in the injecting process will be the same as in the injected process. In order to get code execution to the point of being able to inject code in another process, you need to be inside of a valid context or previously have necessary function pointers anyways. Since EAF does not alert from a valid context, obtaining pointers in the first place should not be an issue. From there, chaining this method with migration is not a problem. This kind of removes some of the novelty from reflective DLL injection. It's known that instead of self-loading, it's possible to perform the loader code from the injector (this method is seen in powerkatz.dll [PowerShell Empire's Mimikatz] and process hollowing). However, recently there was a circumstance where I was forced to use reflective injection due to the constraints I was working within. More on that at a later time, but reflective DLL injection, even with this extra step, still has plenty of uses and is highly coupled to the tools we're currently using... This is a simple fix when the issue comes up. Just got the word that @aleph___naught and I will be presenting a talk and workshop at DEF CON 25. Our talk is a post-exploitation RAT using the Windows Script Host. Executing completely from memory with tons of ways to fork to shellcode. Will contain some original research (with the help of @JennaMagius and @The_Naterz) and amazing prior work by @tiraniddo, @subTee, and @enigma0x3. Queue @mattifestation interjecting with something about app whitelisting! The workshop is not just the tactics, but the code and reverse engineering behind all the stuff in penetration testing rootkits such as Meterpreter and PowerShell Empire. It will include a deep look into Windows internals and some new concepts and ideas not yet present in the normal set of tools. All slides and code will be posted at the end of DEF CON.